The notations IV and IX can be read as "one before five" (4) and "one before ten" (9). 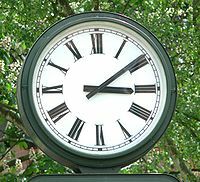 On most clock faces, however, 4 is traditionally written IIII ("four ones"). Other common uses include year numbers on monuments and buildings and copyright dates on the title screens of movies and television programs. MCM, signifying "a thousand, and a hundred less than another thousand", means 1900, so 1912 is written MCMXII. For this century, MM indicates 2000. Thus the current year is MMXIX. 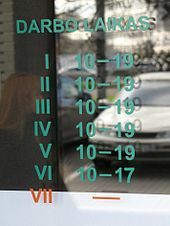 The standard forms for 98 and 99 are XCVIII and XCIX, as described in the "rules" section above, but these numbers are occasionally rendered as IIC and IC, perhaps originally from the Latin duodecentum and undecentum (two/one less than a hundred). Due to the scarcity of surviving examples, the origins of the system are obscure and there are several competing theories, largely conjectural. It system seems to have developed gradually in the area around Rome, possibly before the foundation of the city (sometime between 850 and 750 BCE). At the time, the region was inhabited by diverse populations speaking distinct languages. These included several Italic branches of the Indo-European family, as well as the Etruscans, a people of unknown origin who spoke an isolated language. The Etruscans were the most advanced civilization in the region, and the ancient Romans themselves admitted that they inherited much of their knowledge and customs from them. Besides the Etruscans, the original population of Rome was allegedly drawn mainly from the Latins and the Sabinians, who were only two among the several Italic groups. By the time, the Mediterranean east of Italy had already known several advanced literate civilizations, such as the Ancient Egypt, Phoenicia, Minos, Mycenae and several others in Asia Minor and the Levant. These civilizations influenced the Romans directly or indirectly, such as in the alphabet (via the Etruscans). However, the Roman number system does not seem to have been imported from any of those cultures. The most obvious similarity to their number systems is the use of 10 as the base, instead of 60 (as had been in use in Mesopotamia for a millenium) or 20 (as was used by the Olmec and Mayans in Pre-Columbian America. That choice however seems to have been made through most of Eurasia, including in India and China. The old Egyptian system had a different non-phonetic symbol for each power of ten (so that, like the Romans, they did not need a symbol for zero). However, it repeated that symbol up to nine times to get the digits 1 to 9. They had no separate symbols for 5, 50, etc. The symbol for 1 was a vertical stroke, and that for 10 was an inverted "U"; but higher powers were denoted by figurative hieroglyphs. The classical Greek system also used letters to denote numbers, like the Romans, and a different set of letters for each power of 10. However, the similarities ended there. The Greek system (apparently borrowed from the late Egyptian Hieratic system) uses the first 9 letters of the alphabet to encode the units 1 to 9, then the next 9 letters for the tens 10 to 90, and similarly for the hundreds. 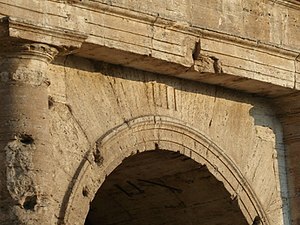 The Etruscan/Roman system in fact did not use letters originally. It used non-phonetic symbols, but (apart from the vertical stroke for 1) they did not resemble the old Egyptian ones. 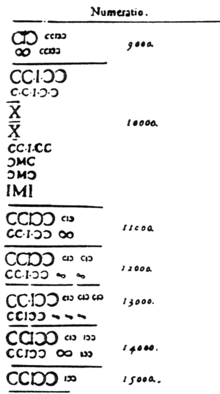 The Etruscans used 𐌠, 𐌡, 𐌢, 𐌣, 𐌚, and ⊕ for 1, 5, 10, 50, 100, and 1000, of which only I and X happened to be letters in their alphabet. Their replacement by letters seems to have been a specifically Roman and relatively late development. The number 50 was written variously as N, И, K, Ψ, ⋔, etc., but perhaps most often as a chicken-track shape like a superimposed V and I: ᗐ. This had flattened to ⊥ (an inverted T) by the time of Augustus, and soon thereafter became identified with the graphically similar letter L. Likewise, 100 was variously Ж, ⋉, ⋈, H, or as any of the symbols for 50 above plus an extra stroke. The form Ж (that is, a superimposed X and I) came to predominate. It was written variously as >I< or ƆIC, was then abbreviated to Ɔ or C, with C variant finally winning out because, as a letter, it stood for centum, Latin for "hundred". The numbers 500 and 1000 were denoted by V or X overlaid with a box or circle. Thus 500 was like a Ɔ superimposed on a ⋌ or ⊢ — that is, like a ⟨Þ⟩ with a cross bar,— becoming D or Ð by the time of Augustus, under the graphic influence of the letter ⟨D⟩. It was later identified as the letter D; an alternative symbol for "thousand" was a bracketed (I) (or CIƆ), and half of a thousand or "five hundred" is the right half of the symbol, I) (or IƆ), and this may have been converted into ⟨D⟩. This at least was the etymology given to it later on. According to P. Kayser, the basic ciphers were I, X, C and Φ (or ⊕) and that the intermediary ones were derived from taking half of those (half an X is V, half a C is L and half a Φ/⊕ is D). The Φ was later replaced with M, the initial of mille (the Latin word for "thousand"). Thus, ⟨I⟩ descends not from the letter ⟨I⟩ but from a notch scored across the stick. Every fifth notch was double cut i.e. ⋀, ⋁, ⋋, ⋌, etc. ), and every tenth was cross cut (X), IIIIΛIIIIXIIIIΛIIIIXII..., much like European tally marks today. This produced a positional system: Eight on a counting stick was eight tallies, IIIIΛIII, or the eighth of a longer series of tallies; either way, it could be abbreviated ΛIII (or VIII), as the existence of a Λ implies four prior notches. 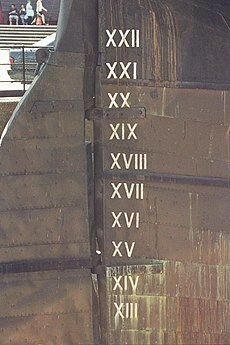 By extension, eighteen was the eighth tally after the first ten, which could be abbreviated X, and so was XΛIII. Likewise, number four on the stick was the I-notch that could be felt just before the cut of the Λ (V), so it could be written as either IIII or IΛ (IV). Thus the system was neither additive nor subtractive in its conception, but ordinal. When the tallies were transferred to writing, the marks were easily identified with the existing Roman letters I, V and X. 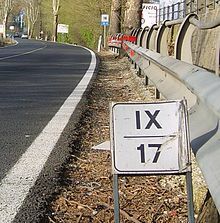 The tenth V or X along the stick received an extra stroke.